To be able to enjoy absolute comfort in the heart of an exceptional site, with access to the spa and pool, and then after a swim, relaxing with a refreshing glass or two of chilled local « Côte de Provence » rosé wine which ideally accompanies delicious freshly barbequed ‘Herbs de Provence’ flavoured grilled meats, Who would not be tempted by this? This fine prestigious property nestling just below the Coudon Mountain, in the heart of the Partegal estate, is not far away from where mingle and flourish, exceptional olive groves (some of which are over several 100 years old), plus of course the famous local fig trees. Many footpaths are also easily accessible from this unique site and its multiple assets will more than delight your visitor’s and family and enable them to enjoy ,as time goes by, many many unforgettable moments. This fine property was constructed in 2009 with a selection of fine and noble materials. Its location offers both the luxury of the calm of the nature, but nevertheless, its situation means it is not too far away from the proximity of a large choice of shops. The choice of available transport is also significant, with Toulon-Hyères International airport and the Toulon TGV station a mere 15 minutes away. Access to the many nearby Mediterranean beaches in just a quarter of an hour completes this beautiful postcard. 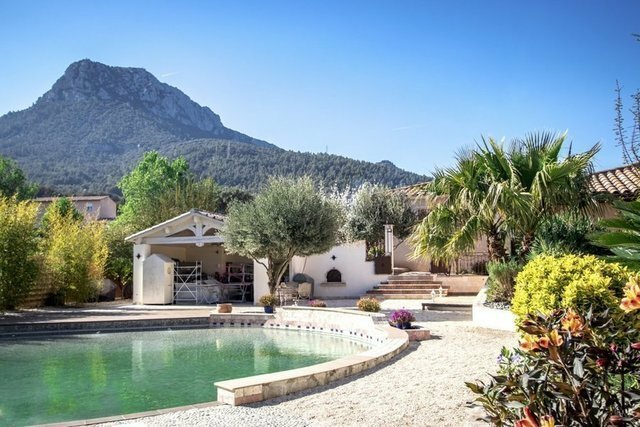 The whole of the property, thanks to is southern exposure, is bathed with light and not only offers a main house of 300m² but also a second one of 100m². In addition, this property boasts: • The principal building on 2 levels consists of, on the ground floor, an imposing airy ‘cathedral style’ living room of 95 m² incorporating a modern kitchen leading to 3 master bedroom suites and upstairs, an additional 2 suites, all of which are equipped with their own shower room and WC. • The second house has not only a lounge but also a living/dining room complete with an open kitchen plus 2 master bedroom suites. • A superb garden complete with a fish pond, plus a shaded terrace of 70 m² and other terraces. • A luxurious heated swimming pool of 90m², a large 40m² spa enough for 10, which includes also a sauna. • Parking spaces that can accommodate many vehicles. This property, very rare of its type on the market place, could also prove to be an excellent investment by renting it out as a bed and breakfast or "chambre d'hôtes".